How can I add an empty directory (that contains no files) to a Git repository? Then you don't have to get the order right the way that you have to do in m104's solution. This also gives the benefit that files in that directory won't show up as "untracked" when you do a git status. I think it's worth noting that this solution does precisely what the question asked for, but is not perhaps what many people looking at this question will have been looking for. This solution guarantees that the directory remains empty. It says "I truly never want files checked in here". As opposed to "I don't have any files to check in here, yet, but I need the directory here, files may be coming later". You can't. See the Git FAQ. Directories are added automatically when adding files inside them. That is, directories never have to be added to the repository, and are not tracked on their own. You can say "git add <dir>" and it will add files in there. Create an empty file called .gitkeep in the directory, and add that. You could always put a README file in the directory with an explanation of why you want this, otherwise empty, directory in the repository. On Linux, this creates an empty file named .keep. This name is preferred over .gitkeep as the former is agnostic to Git, whereas the latter is specific to Git. Secondly, as another user has noted, the .git prefix convention should be reserved for files and directories that Git itself uses. Alternatively, as noted in another answer, the directory can contain a descriptive README or README.md file instead. Of course this requires that the presence of the file won't cause your application to break. An empty directory cannot be part of a tree under the Git versioning system. related to the above, some projects won't work without some folders (which is often a hint of a poorly designed project, but it's a frequent real-world scenario and maybe there could be, say, permission problems to be addressed). Creating a .gitignore file with a sort of "reverse logic" (i.e. to include all the files) which, at the end, serves the same purpose of approach #1. While both solutions surely work I find them unconsistent with a meaningful approach to Git versioning. Why are you supposed to put bogus files or READMEs that maybe you don't really want in your project? 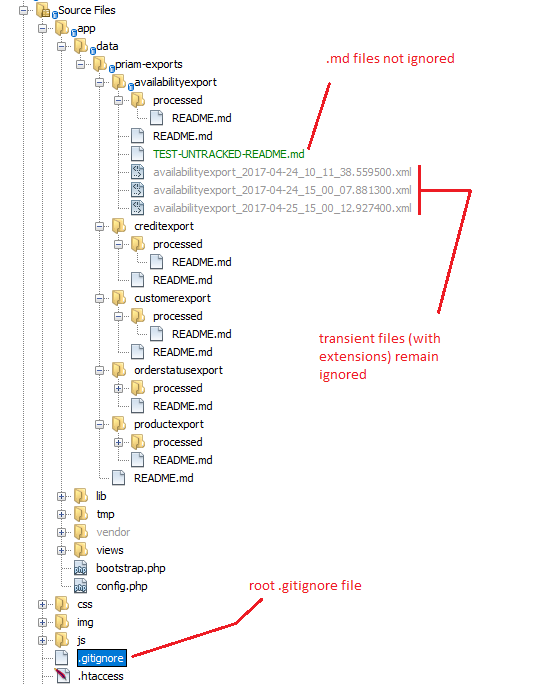 Why use .gitignore to do a thing (keeping files) that is the very opposite of what it's meant for (excluding files), even though it is possible? Use an empty file called .gitkeep in order to force the presence of the folder in the versioning system. You use a file that has the single purpose of keeping the folder. You don't put there any info you don't want to put. For instance, you should use READMEs as, well, READMEs with useful information, not as an excuse to keep the folder. Separation of concerns is always a good thing, and you can still add a .gitignore to ignore unwanted files. I've seen the .gitkeep approach adopted by very important frameworks like Laravel, Angular-CLI. Andy Lester is right, but if your directory just needs to be empty, and not empty empty, you can put an empty .gitignore file in there as a workaround. As an aside, this is an implementation issue, not a fundamental Git storage design problem. As has been mentioned many times on the Git mailing list, the reason that this has not been implemented is that no one has cared enough to submit a patch for it, not that it couldn’t or shouldn’t be done. Now the log directory will be included in the tree. It is super-useful when deploying, so you won't have to write a routine to make log directories. but you probably knew that. Git does not track empty directories. See the Git FAQ for more explanation. The suggested workaround is to put a .gitignore file in the empty directory. I do not like that solution, because the .gitignore is "hidden" by Unix convention. Also there is no explanation why the directories are empty. I suggest to put a README file in the empty directory explaining why the directory is empty and why it needs to be tracked in Git. With the README file in place, as far as Git is concerned, the directory is no longer empty. The real question is why do you need the empty directory in git? Usually you have some sort of build script that can create the empty directory before compiling/running. If not then make one. That is a far better solution than putting empty directories in git. So you have some reason why you need an empty directory in git. Put that reason in the README file. That way other developers (and future you) know why the empty directory needs to be there. You will also know that you can remove the empty directory when the problem requiring the empty directory has been solved. WARNING: This tweak is not truly working as it turns out. Sorry for the inconvenience. I found a solution while playing with Git internals! Suppose you are in your repository. Type the command and then enter the second line. Press Enter and then Ctrl + D to terminate your input. Note: the format is mode [SPACE] type [SPACE] SHA-1hash [TAB] path (the tab is important, the answer formatting does not preserve it). That's it! Your empty folder is in your index. All you have to do is commit. The empty tree SHA-1 can be found by creating a new empty Git repository, cd into it and issue git write-tree, which outputs the empty tree SHA-1. I've been using this solution since I found it. It appears to work exactly the same way as creating a submodule, except that no module is defined anywhere. This leads to errors when issuing git submodule init|update. The problem is that git update-index rewrites the 040000 tree part into 160000 commit. Moreover, any file placed under that path won't ever be noticed by Git, as it thinks they belong to some other repository. This is nasty as it can easily be overlooked! However, if you don't already (and won't) use any Git submodules in your repository, and the "empty" folder will remain empty or if you want Git to know of its existence and ignore its content, you can go with this tweak. Going the usual way with submodules takes more steps that this tweak. Maybe adding an empty directory seems like it would be the path of least resistance because you have scripts that expect that directory to exist (maybe because it is a target for generated binaries). Another approach would be to modify your scripts to create the directory as needed. In this example, you might check in a (broken) symbolic link to the directory so that you can access it without the ".generated" prefix (but this is optional). If you take the oft-suggested approach of checking in an almost-empty folder, you have the minor complexity of deleting the contents without also deleting the ".gitignore" file. In other words, you need to add the .gitignore file to the index before you can tell Git to ignore it (and everything else in the empty directory). I've been facing the issue with empty directories, too. The problem with using placeholder files is that you need to create them, and delete them, if they are not necessary anymore (because later on there were added sub-directories or files. With big source trees managing these placeholder files can be cumbersome and error prone. This is why I decided to write an open source tool which can manage the creation/deletion of such placeholder files automatically. It is written for .NET platform and runs under Mono (.NET for Linux) and Windows. You can't and unfortunately will never be able to. This is a decision made by Linus Torvald himself. He knows what's good for us. There is a rant out there somewhere I read once. I found Re: Empty directories.., but maybe there is another one. You have to live with the workarounds...unfortunately. When you add a .gitignore file, if you are going to put any amount of content in it (that you want Git to ignore) you might want to add a single line with just an asterisk * to make sure you don't add the ignored content accidentally. I like the answers by @Artur79 and @mjs so I've been using a combination of both and made it a standard for our projects. However, only a handful of our developers work on Mac or Linux. A lot work on Windows and I could not find an equivalent simple one-liner to accomplish the same there. Some were lucky enough to have Cygwin installed for other reasons, but prescribing Cygwin just for this seemed overkill. It will allow you to create and remove .gitkeep files recursively, and it will also allow you to add messages to them for your peers to understand why those directories are important. This last bit is bonus. I thought it would be nice if the .gitkeep files could be self-documenting. sub-directories in the specified path. -l, --let-go        Remove the .gitkeep files from the specified path. directory to source control even if it's empty. -v, --verbose       Print out everything. As mentioned it's not possible to add empty directories, but here is a one liner that adds empty .gitignore files to all directories. I have stuck this in a Rakefile for easy access. With this solution you are able to commit a empty folder, for example /log, /tmp or /cache and the folder will stay empty. I always build a function to check for my desired folder structure and build it for me within the project. This gets around this problem as the empty folders are held in Git by proxy. This is in PHP, but I am sure most languages support the same functionality, and because the creation of the folders is taken care of by the application, the folders will always be there. This will add a folder and a file .submodules. Commit a change. Delete .submodules file and commit the change. I wouldn't encourage to use it though since it may stop working in the future versions of Git. Which may leave your repository corrupted. There's no way to get Git to track directories, so the only solution is to add a placeholder file within the directory that you want Git to track. The file can be named and contain anything you want, but most people use an empty file named .gitkeep (although some people prefer the VCS-agnostic .keep). The prefixed . marks it as a hidden file. Another idea would be to add a README file explaining what the directory will be used for. You can't. This is an intentional design decision by the Git maintainers. Basically, the purpose of a Source Code Management System like Git is managing source code and empty directories aren't source code. Git is also often described as a content tracker, and again, empty directories aren't content (quite the opposite, actually), so they are not tracked. Then you can commit descriptive README.md files (or blank files, doesn't matter, as long as you can target them uniquely like with the *.md in this case) in each directory to ensure that the directories all remain part of the repo but the files (with extensions) are kept ignored. LIMITATION: . 's are not allowed in the directory names! You can fill up all of these directories with xml/images files or whatever and add more directories under /app/data/ over time as the storage needs for your app develop (with the README.md files serving to burn in a description of what each storage directory is for exactly). Adding one more option to the fray. Assuming you would like to add a directory to git that, for all purposes related to git, should remain empty and never have it's contents tracked, a .gitignore as suggested numerous times here, will do the trick. Another option (in response to a comment by @GreenAsJade), if you want to track an empty folder that MAY contain tracked files in the future, but will be empty for now, you can ommit the * from the .gitignore file, and check that in. Basically, all the file is saying is "do not ignore me", but otherwise, the directory is empty and tracked. That's it, check that in, and you have an empty, yet tracked, directory that you can track files in at some later time. The reason I suggest keeping that one line in the file is that it gives the .gitignore purpose. Otherwise, some one down the line may think to remove it. It may help if you place a comment above the line. You can save this code as create_readme.php and run the PHP code from the root directory of your Git project. It will add README files to all directories that are empty so those directories would be then added to the index. Sometimes I have repositories with folders that will only ever contain files considered to be "content"—that is, they are not files that I care about being versioned, and therefore should never be committed. With Git's .gitignore file, you can ignore entire directories. But there are times when having the folder in the repo would be beneficial. Here's a excellent solution for accomplishing this need. However, these folders then don't become part of the repo. You could add something like a README file in there. But then you have to tell your application not to worry about processing any README files. The first line (*) tells Git to ignore everything in this directory. The second line tells Git not to ignore the .gitignore file. You can stuff this file into every empty folder you want added to the repository. Not the answer you're looking for? Browse other questions tagged git directory git-add or ask your own question. How to .gitignore all files/folder in a folder, but not the folder itself? Does Git delete empty folders? Is it possible to make git to track empty folders? How do I add an empty directory in Git? Is there a way to check in empty directory?